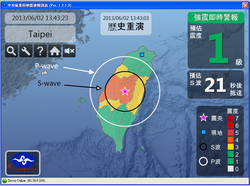 ​​CAN I GET WARNING OF AN EARTHQUAKE? ​CAN I SHUT DOWN ​MY SYSTEMS AUTOMATICALLY? ​CAN I QUICKLY KNOW IF MY BUILDING MAY BE DAMAGED? ​CAN THIS BE DONE ECONOMICALLY? AS A BUSINESS CAN I GET DATA ON THE QUAKE EFFECT? Currently the only Seismic devices sold in New Zealand that have been tested and certified by an internationally accredited TAF Lab . The only Structural Health Solution sold in New Zealand that uses TAF Lab tested and certified instruments. Many thousands of Palert instruments sold across the world. Largest amount of international scientific white papers available for any seismic system sold commercially in NZ. The only commercially available system sold in New Zealand that is used by governments internationally as an approved Earthquake Early Warning System for entire countries. The only system sold in New Zealand backed by a publicly listed USD 80 million, company with over 50 years experience in the geotechnical, engineering construction, manufacturing, vibration and earthquake monitoring fields. Typical site protection, with a few units, is under $8,000 USD. The specially developed and scientifically proven algorithm make the Palert unique in earthquake prewarning which is why over 3,500 have now been installed worldwide. Many businesses need to know what the effect of an earthquake is on their infrastructure. With just 3 units the system can also accurately indicate the structural health of a building after a major quake. To mitigate the Health and Safety risk, companies can provide warning for their staff and visitors of earthquakes before the shock wave arrives using the Palert system. In addition they can automatically activate emergency procedures such as shutting down systems in the event of a pending shake. This short video shows the system in operation in Taiwan. It is a real earthquake that the system detected using the P-wave of the quake, then using the special algorithm it calculates the shock wave to be a level 5 and ultimately provides 18 seconds warning. ​Watch what happens when the countdown reaches 0!! The system has been in operation now for nearly 10 years in Taiwan, especially in schools, with around 1500 units deployed. The school systems cost only $2,500 per site as part of the early warning solution. Ever wondered what you can do with just a few seconds warning. Not sure? Then watch this Japanese promotional video. With just 10 seconds the gas and electricity is switched off, the door propped open in case of damage to the building, and then the actress "drops, covers, holds" as the earthquake shake arrives. ​• P wave propagates 1.77 ~ 1.87 times faster than S wave. ​If the earthquake is only 75 km away the system will give you 10 seconds warning. Below is a video of how an earthquake propagates through the Palerts in Taiwan and how some areas have higher shaking than others even though further away from quake.